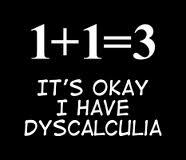 Dyscalculia can be described as an innate specific learning disability (in the mind) that prohibits various levels of understanding in mathematics. It is very similar to dyslexia and in some cases, children/adults can have both. The main difference between the two is the difficulty in understanding nu...mbers, ie. 5 back to front and getting sums reversed (54 x 4 can be read as 45 x 4), learning how to manipulate numbers, learning maths facts and a number of other related symptoms. As with dyslexia, Maths disabilities can also occur as the result of some types of brain injury (apraxia), in which case the proper term is acalculia, to distinguish it from dyscalculia which is of innate, genetic or developmental origin. Although maths learning difficulties can be generic, occurring in children with low levels of academia, dyscalculia also affects people from across the whole IQ range and sufferers often, but not always, also have difficulties with telling the time and measuring (eg. cooking). Estimates of the population with dyscalculia range between 3 and 6%. Dyscalculia can cause problems with the written maths and indeed for those with dyslexia and dyscalculia, algebra can cause particular problems as the calculations and written word become entwined…however, not so with physical maths (eg. counting with fingers or an abacus) as this is visual. Learning Maths through the visual channel is very important (games , etc.). Also, I find that some, but not all, children are no longer being taught by rote (ie. memorising through repetition)…children with specific learning needs would benefit from this method. Symptoms of dyscalculia could be if you throw down a number of coins or counters in a random fashion the child/adult would have difficulty in arriving at the correct value/number. They would have a far greater chance of accuracy if they were in rows. Also, with varied objects i.e. one of each…cow, pig, horse, dog for example…they would then use their visual image side to great effect and gain the correct answer and with increased speed too. Reading a clock is also difficult, especially analogue as opposed to digital…again games can speed this up. Also, going in up in 5’s is good (5, 10, 15 mins) and avoid the ‘to the hour’, just use past the hour, ie. 10,20,30,40 mins past, etc. ‘Quarter past/to’ and ‘half past’ can be introduced later on. Also time keeping can be a problem – it’s beneficial to use minutes when giving instruction, ie. we’re going out in 10 minutes, it’ll be time for bed in 20 minutes, as they will find this easier to understand.